Letters to Lovie, episode 1. I, along with many other Bears fans, spent last week looking forward to spending a beautiful Saturday in the city capped off by watching our beloved Bears play their final home preseason game this season at Soldier Field. You can certainly imagine our dismay that from the opening kickoff on, the team seemed lackluster and failed to really accomplish anything on either side of the ball. We, as fans, understand that bad games happen (ie Chris Williams vs the Raiders) but this was more than that. This was an entire team failure vs a mediocre Cardinals team which was without their superstar wideout. Monday, however, it all became clear. I heard some post game comments you made which included calling the game Saturday night a “glorified practice”. I believe this is where the confusion lies, see we the fans paid full price for our tickets to a GAME, which you mistakenly thought was practice. As I understand it, we can come down to Bourbonnais and watch practices for free, but we pay full regular season prices to watch games at Soldier Field, be they preseason or otherwise. In light of this mistake on your part, I would appreciate a refund of my $160 for tickets to the game Saturday, since that is clearly not what you intended it to be. With the addition of Julius Peppers and with Brian Urlacher back in the line up, the Bears defense has a chance to be great average this season. Let’s take a look at each position. DE – Welcome Julius. Teams will have to gameplan on how to stop him. Knowing that, the Bears would be smart to get him reps on both sides. Rookie Corey Wootton looks to back up Peppers on the right side. The left side will be a battle between Mark Anderson and Isreal Idonije. Will Anderson looks to be the starter, Izzy is impressing so far in camp and preseason. Henry Melton could be the odd man out here. DT – Tommie Harris is actually healthy enough to practice, that’s a first. Let’s see if that will translate onto the field. Anthony Adams looks to start next to him, with Marcus Harrison backing them up being able to play both positions. The battle will be between Matt Toeaina and Jarron Gilbert. My guess would be to keep 4 – DE’s and 5 – DT’s with Gilbert also being able to play outside if need be. OLB – Pisa Tinoisamoa and Nick Roack will compete for the starting job at strong side linebacker. Right now Pisa is getting the reps with the 1’s, but Roach won’t go away easy. 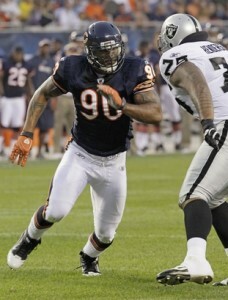 On the weak side, Lance Briggs will remain awesome the starter, with Brian Iwuh providing depth. Tim Shaw adds depth to both postions and is a special teams stud. Hopefully, the Bears find room to keep all 5 of these guys. MLB – Some guy named Brian Urlacher will return to his starting position in the middle. The ever reliable Hunter Hillenmeyer will back him up. CB – Charles Tillman and Zack Bowman will remain the starters, but will switch sides. Corey Graham and Tim Jennings will back them up, with Graham penciled in at nickel back. DJ Moore and Joshua Moore will compete for the last roster spot. S – Chris Harris is back, and will start at free safety. When healthy, Major Wright has impressed and will most likely start opposite. Danieal Manning and Craig Steltz will rotate in when needed. Josh Bullocks could be odd man out, and Quentin Scott looks like practice squad material. With training camp under way, there are still a few positions up for grab. Only the hot days of August will decide the fate of a few. Players in some positions seem like a lock, but lets still take a look at the depth as well. 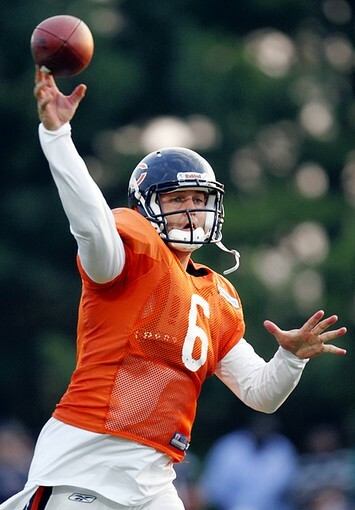 QB – Jay Cutler – Everyone says he needs to throw less interceptions that last year. Agreed. But in won’t be by much. Mike Martz’s system is to score everytime a take chances. Either it’ll be a marriage made in heaven, or will end worse than a Tiger Wood’s divorce. There’s not much for back up behind Cutler, but history proves it most likely will not be needed. Caleb Hanie seems to be struggling a little with Martz’s system, but is still the back up favorite. Dan LeFevour fell into their laps in the 6th round, but he’s a project. The signed Mike Teel, who knows the Martz system. The Bears traditionally only carry two QB’s on their roster, one on the practice squad. But this year may be three on the roster…..should be interesting. RB – Matt Forte – coming off a season long knee aggravation, Forte has been said to seem quicker and faster in OTA’s. So far in training camp, everyone has been impressed with his quickness. He’s back, healthy, and 100%. But I’m not too concerned with Chester Taylor backing him up. Actually, I wouldn’t be surprised if Taylor gets more reps than Forte and the season goes on. Either way, a great 1-2 punch. The real story comes down to the 3rd string back. Do they keep Wolfe, the special teamer, or Bell, a power runner? But there’s also a newcomer to the party, Harvey Unga, who is nursing a hamstring. The question remains whether to carry three or four RB’s. FB – Eddie Williams was brought in from the Redskins. Will Ta’ufo’ou is challenging for the position. WR – Hester, Knox, Bennett, Aromashodu. And I hate to say it, the 5th will be Rashied Davis or Juaquin Iglesias. Ugh, seems like Davis is the favorite so far in training camp, damn him. There really will be no position battles. I don’t believe Freddie Barnes will be able to beat any of these guys out. TE – Brandon Manumaleuna and Greg Olsen are the only locks. The rest is up for grabs. Desmond Clark, Kellen Davis, and Richard Angulo for most likely a 3 position spot in the Martz system. OT – Chris Williams is the only lock at starting LT. Frank Omiyale is still running with the first team at RT, but is only one false start penalty away from riding the bench. Shaffer provides a nice back up at RT if needed. James Marten impressive so far, but still an uphill battle. J’Marcus Webb still a project. OG – It’s a 4-way battle for 2 spots. Garza, Beekman, Asiata, and Louis will battle it out in training camp. While Beekman and Garza have the experience at the position, Asiata and Lance Louis have the size to dominate the position. This is definitely the most intriguing battle to watch for. C – Olin Kreutz will be your starter like it or not. Beekman and Garza can both fill the position if there is a need.